If you believe the festive ads, loneliness at Christmas seems to be a preserve of the elderly. John Lewis isolates an old man on the moon, and the German company Edeka sees an elderly father fake his own death in order to bring his family together for the festive period. 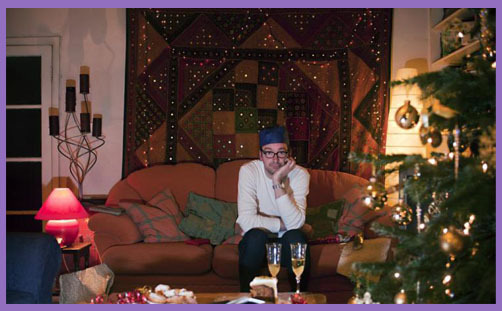 Both jerk a tear (rather well), and Age UK will tell you that thousands upon thousands of our senior citizens will indeed spend Christmas Day talking to the telly or staring out of the window. But so will thousands of middle-aged and younger single people. They’ll go to bed on Christmas Eve after watching A Muppet Christmas Carol for the fourth time; perhaps they’ll have bothered to mull a glass of wine and microwave a mince pie, but joy and laughter will be half a world away. Some will have hummed along to Carols from Kings, as they do every year, staring at the lights draped around the tinsel tree which they painstakingly decorated for not a word of praise from any soul. Because there’s no one there for them. ‘In the Bleak Midwinter’ isn’t just a carol; it’s the haunting essence of Christmas Day. Singleness loneliness is rarely talked about. The assumption is that the young, fit and gregarious could easily go to their parents’ for the day if they wanted to, and they’re probably not short of half-a-dozen invitations for champagne and turkey with friends. And some indeed may receive such invitations, and yet still decline, feeling unable to accept for fear of extracting token presents from another family’s merriment. They’re not a purposeful obdurate Grinch; it’s just that seeing others’ happiness tunes them back to the wavelength of their own loneliness. It’s a sad cycle of self-isolation. And then there are the separated, divorced or recently-bereaved. Relationships break down, and some never get started for various reasons of disposition, orientation or holy vocation. And some end tragically and unexpectedly: widows and widowers come in all shapes and ages. When you lose your life partner, your soulmate, the one you hoped would sleep at your side and share a thousand old and grey moments with you, you drift aimlessly from room to room hearing echoes of laughter from the ghosts of Christmases past, and you howl. But it’s a private sob; an inconsolable song of grief which no one else hears. You just wander up to bed dreading waking up to a cold, silent, empty home. There’ll be no one there in the morning to wish you a Merry Christmas; no one with whom you can toast the birth of the Saviour, or hand you a shiny purple gift with a whispered kiss. And the lovely water spaniel you once taught to speak with her eyes and roll over for a meaty morsel no longer wags her tail. You greet the imaginary presence, but there’s no patter of tiny paws or morning licks of love. No sliding on the ice or bounding in the snow with a flashing-blue jungle-bell Christmas collar. She’s gone, too, and all that’s left are golden hairs on the carpet and bits of chewed slipper. You keep finding them in dark corners: every precious fragment is a recollection of past playtimes and puppiness. But that’s all gone. Don’t mock loneliness or deride the lonely until you’ve sat down and listened to someone bawling their eyes out for what might have been or used to be and will never be again. You may go to bed at midnight, wide-eyed with joy and childish anticipation. They, childless, fly back to their childhood, to an age when Santa came down chimneys, Rudolf shone, snowmen talked, and we three kings from Orient were. And now, grown up, all they have to look forward to is chopping a carrot, peeling three potatoes and cooking a roast for one. If they can be bothered. Oh, family will phone, and merry-christmases will be exchanged. But don’t ask them if they’re okay or what they’re doing for the day. They’ll just laugh and lie in their loneliness. It’s normal. The Fourth Sunday in Advent.The Collect. LORD, raise up (we pray thee) thy power, and come among us, and with great might succour us; that whereas, through our sins and wickedness, we are sore let and hindered in running the race that is set before us, thy bountiful grace and mercy may speedily help and deliver us; through the satisfaction of thy Son our Lord, to whom with thee and the Holy Ghost be honour and glory, world without end. Amen. The Epistle. Phil. 4. 4. EJOICE in the Lord alway: and again I say, Rejoice. Let your moderation be known unto all men. The Lord is at hand. Be careful for nothing; but in every thing by prayer and supplication with thanksgiving let your requests be made known unto God. And the peace of God, which passeth all understanding, shall keep your hearts and minds through Christ Jesus. The Gospel. St. John 1. 19. HIS is the record of John, when the Jews sent priests and Levites from Jerusalem to ask him, Who art thou? And he confessed, and denied not; but confessed, I am not the Christ. And they asked him, What then? Art thou Elias? And he saith, I am not. Art thou that prophet? And he answered, No. Then said they unto him, Who art thou? that we may give an answer to them that sent us. What sayest thou of thyself? He said, I am the voice of one crying in the wilderness, Make straight the way of the Lord, as said the prophet Esaias. And they which were sent were of the Pharisees. And they asked him, and said unto him, Why baptizest thou then, if thou be not that Christ, nor Elias, neither that prophet? John answered them, saying, I baptize with water: but there standeth one among you, whom ye know not; He it is, who coming after me is preferred before me, whose shoe’s latchet I am not worthy to unloose. These things were done in Bethabara beyond Jordan, where John was baptizing.